Mental health is still the elephant in the room. In fact, it’s the elephant in the office, in the factory and down the mine. It’s that great big giant thing which everyone, in workplaces everywhere has been very carefully tiptoeing around for far too long. Unfortunately, most managers still aren’t up for elephant handling. Instead they continue to rely on a variety of ill-conceived approaches. This approach has been used for decades and for decades it hasn’t worked. In fact, the elephant has just continued to grow bigger and bigger. In Australia, the cost to organisations of poor workplace mental health is now estimated at $12 billion a year. Considering most mental health conditions are preventable, that’s not only a great deal of wasted money, it’s also a hell of a lot of unnecessary suffering. RU OK Day is a brilliant idea and we’d encourage every organisation to get behind it… but we would also urge them to do something about mental health on those other 364 days. You simply will not shift the elephant by annually putting up some pretty banners and sending out an appropriate-sounding group email. While RU OK Day is an important opportunity to build awareness and keep the conversation going, mental health is something that needs to be continually improved upon with better policies, better programs and authentic leadership. To create real change, your employees require training programs based on real evidence. No one can solve mental health problems by simply handing out stress balls, arranging one-off meditation sessions or bringing in an ex-footballer to recount their highs and lows. Perhaps unsurprisingly, the science shows that these sorts of token efforts do next to nothing in improving mental health. If you want to make a real difference, you would be well advised to take all that money which is currently being wasted on ineffective box-ticking measures and redirect it towards evidence-based programs which will equip your workers with the appropriate psychological skills and support. After a lot of people making a lot of noise and pointing, it’s now very hard for managers to deny the existence of the elephant. Unfortunately, most still don’t know quite what to do about it. Many feel awkward. Some feel ill-equipped to help. Others feel scared to death of dealing with a colleague in an emotional state. If we are to ever get better at managing mental health, we must train managers so they can confidently communicate and help get people the right support. Some leaders like to think of themselves as so tough that they could take down any elephant. They don’t want to change a culture where they “work hard, play hard” and “win at all costs”. In these workplaces the biggest, baddest, toughest dinosaurs are celebrated and those who “can’t hack it” are spat out with disdain. These proud T-Rex’s will look contemptuously at the elephant and tell it to “harden up”. Sadly, these workplaces are likely to remain toxic until all the dinosaurs finally die out (ironically, most of these dinosaurs will have death-bed epiphanies where they realise they shouldn’t have wasted so much of their life working in horrible workplaces). 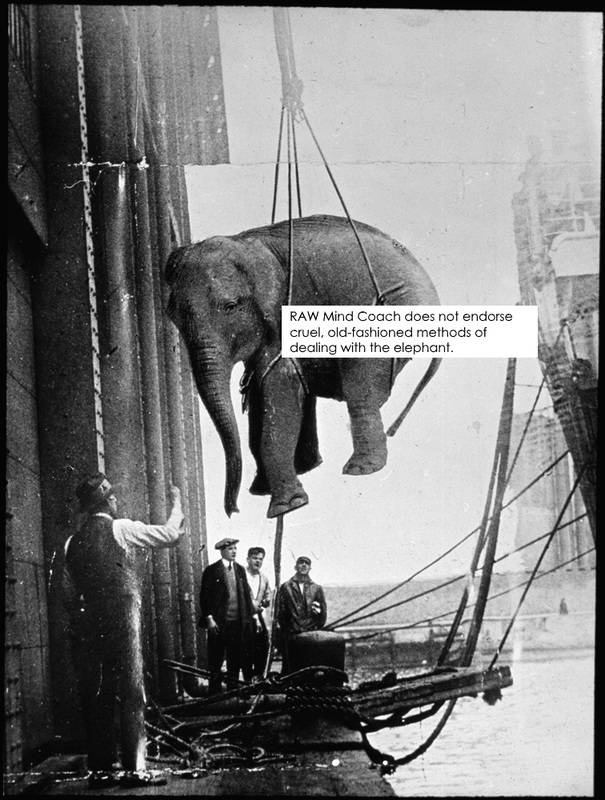 To stretch this overstretched metaphor even further, RAW Mind Coach is in the business of elephant handling. If your organisation is still stuck using one of the approaches above, we’re sure we can be of real assistance. We have a whole team of experienced senior psychologists who have no fear of elephants or tears, or awkwardness or moments of intense, whole-hearted honesty (in fact, they view vulnerability as courageous). Our online learning program was developed relying on in-depth research (including a Randomised Control Trial) and a range of therapies with an already strong evidence-base. It develops essential skills, builds psychological resilience and ensures workers know what to do whenever the going gets tough. We can also provide specialist training to help managers better support their colleagues. While we can help with a wide range of elephant related issues, we often find there is a sixth ill-conceived approach, which also must be overcome. When it comes to mental health, good intentions are not nearly enough. Unfortunately, far too many organisations keep sitting on their hands whilst saying all the right things. To create meaningful change, real action must be taken. Often this change simply comes down to having a few people with the passion and determination to break through the barriers, blow past the bureaucracy and get things done. We’ve been fortunate enough to work with a number of amazing people like this and it makes all the difference. Not only will these dedicated people get the ball rolling, they will also keep pushing until that ball has all the size and momentum of the one chasing Indiana Jones! If you are one of these wonderful people who is committed to making a real difference, we invite you to simply give us a call or drop us an email today. We love nothing more than working with people who share our passion and have a genuine commitment to improving mental health.